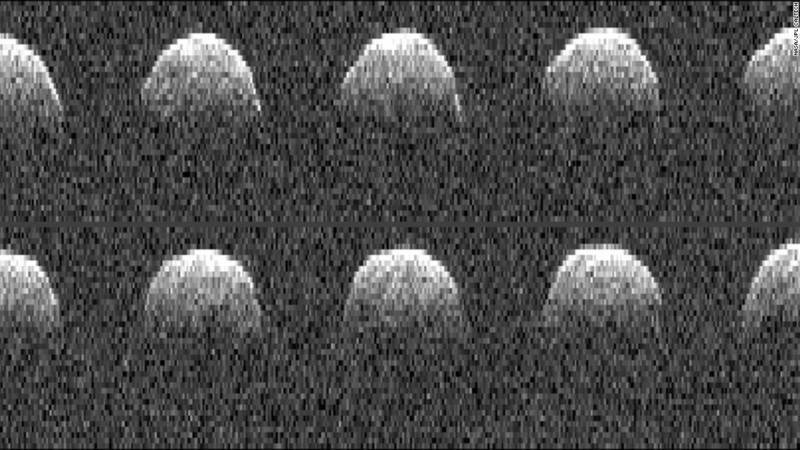 Why Is NASA Checking Out This Asteroid? On September 22, a spaceship visited Earth—NASA can confirm that it wasn't alien property. It was NASA's own OSIRIS-REx probe, swinging by Earth in a gravitational "slingshot" maneuver designed to fling it toward a 2018 rendezvous with an asteroid named Bennu. The spacecraft will become NASA's first mission ever to visit an asteroid, collect samples of its ancient materials, and return them to Earth for laboratory analysis. More than merely an asteroid-dust collector, however, this mission aims to give scientists a clearer understanding of the formation of the solar system, the Earth, and the origin of life on our planet. 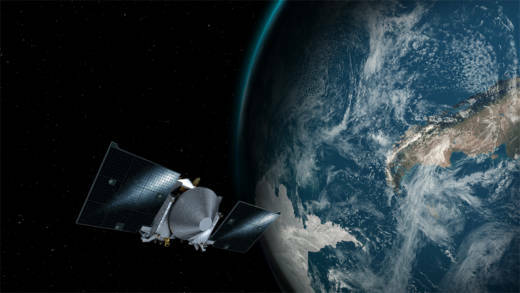 Launched on September 8, 2016, OSIRIS-REx —which stands for Origins, Spectral Interpretation, Resource Identification and Security-Regolith Explorer—will arrive at Bennu in August 2018, where it will map the asteroid's surface in detail, and then graze to within a few meters of its surface to collect dust samples. It will then head back to Earth for an expected return in 2023. What Can Asteroids Tell Us About Life on Earth? Asteroids—as well as comets—are the debris left over from the formation of our solar system, about 4.6 billion years ago, and are potential gold mines of information about the early conditions that shaped Earth and the other planets. They formed during the earliest times in the solar system, and have remained largely unchanged since then. On Earth, geological action and weathering alter terrestrial rocks over time, effectively erasing information about the earliest conditions on our planet. Attempting to reconstruct the environment that led to the origin of life on Earth by studying terrestrial rocks is a bit like trying to perceive an artist's original painting on a canvass that has been painted over multiple times. Were Oceans Filled by Asteroids Like Bennu? Bennu is a roughly 500-meter diameter Near-Earth Asteroid--one whose closest approach to the sun is less than 120 million miles. Not only is it close to Earth and relatively easy to visit, it is a "carbonaceous" asteroid—rich in carbon compounds, as well as other materials like water. This makes it a good candidate for testing a theory that the young Earth may have been supplied with organic materials (compounds of carbon and hydrogen) and water from asteroids like Bennu colliding with our planet, during a period called the "Late Heavy Bombardment" between 3.8 and 4.1 billion years ago. We know that during this period, the moon, as well as Earth and the other planets of the inner solar system, were showered by large numbers of asteroids and comets—a fact that our moon and the planets Mercury and Mars testify to with tens of thousands of ancient impact craters. The materials carried by the impacting objects became part of the makeup of Earth's crust, and are thought to have supplied some or much of Earth's surface water and the organic compounds that set the stage for the appearance of life. Have Comets Fallen Out of Favor? For many years, comets were singled out as a likely source of Earth's water and organic materials. Comets are composed largely of water ice and chemicals like ammonia. More recently, we've also discovered organic hydrocarbon compounds mixed in. Attempts to match the chemical signatures of the water in Earth's ocean with the water-ice in comets have yielded mixed results. Of several comets from which measurements have been obtained—most recently comet 67P/Churyumov-Gerasimenko visited by the European Rosetta spacecraft in 2014—a trend has developed that points away from comets as a significant source of Earth's fertile starting point. At the same time, the detection of water ice and carbon compounds within some asteroids has revealed that they are not merely bone-dry hunks of rock and metal as once assumed, strengthening the argument favoring asteroids as the main contributors of those precious materials. In 2015 NASA's Dawn spacecraft discovered that the former asteroid (now dwarf planet) Ceres may contain a mantle of ice greater in mass than all of Earth's fresh water. Recently there has been a lot of concern over the probabilities of Near-Earth Asteroids (of which Bennu is one) colliding with Earth and wreaking havoc and devastation to humans, Earth's ecosystems, and even our civilization. It is amusing to think that the first spacecraft mission sent to one of these potential Earth-colliding, flying mountains is aimed at understanding how objects such as these may have brought life to Earth in the first place. 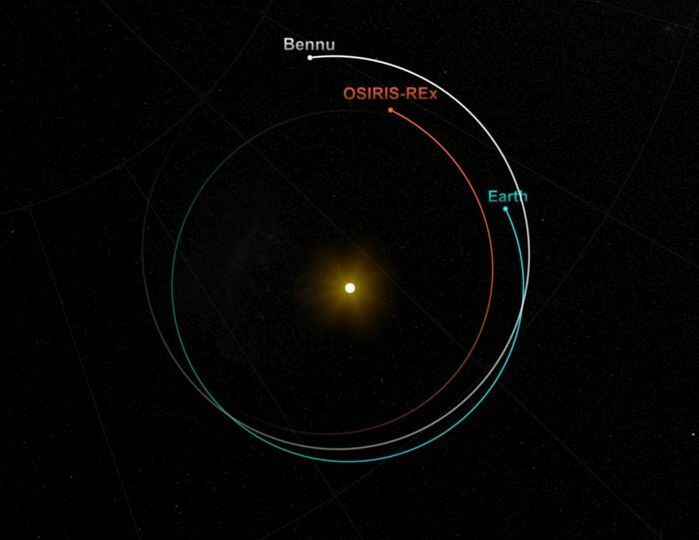 Now that OSIRIS-REx has completed its slingshot maneuver past Earth, it should be smooth sailing all the way to Bennu. NASA will use the time to test the health of its systems and functions. Then, next August when the spacecraft is a little more than a million miles from the asteroid, it will use its thrusters to match course and speed with the asteroid to set up for a final approach.